After years in the beach-side community of Venice, these homeowners wanted to bring their old hood's unexpected, playful moments to their new home without losing the bright, calming aesthetic of the space. 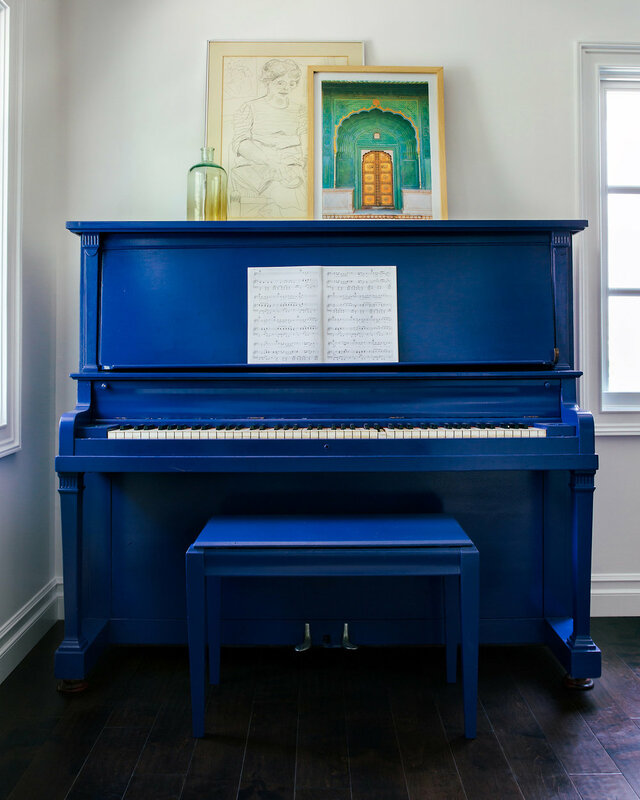 Capturing childhood memories of listening to music with her grandfather, we turned our client’s album collection into deeply personal art. Everything is better in blue. We all do it. Walk in the door and drop everything. 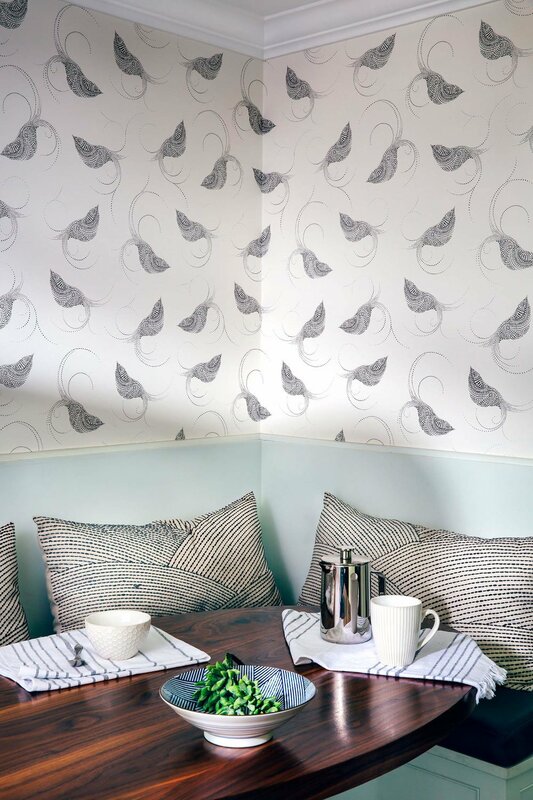 This chic landing zone holds it all and looks great doing it. Plush velvet in rich jewel tones—the perfect way to say come in.. This bar cabinet plays double-duty adding beautiful pattern when closed and always ready to entertain. Chalkboard walls and a generous crafts table means low-tech fun all day. 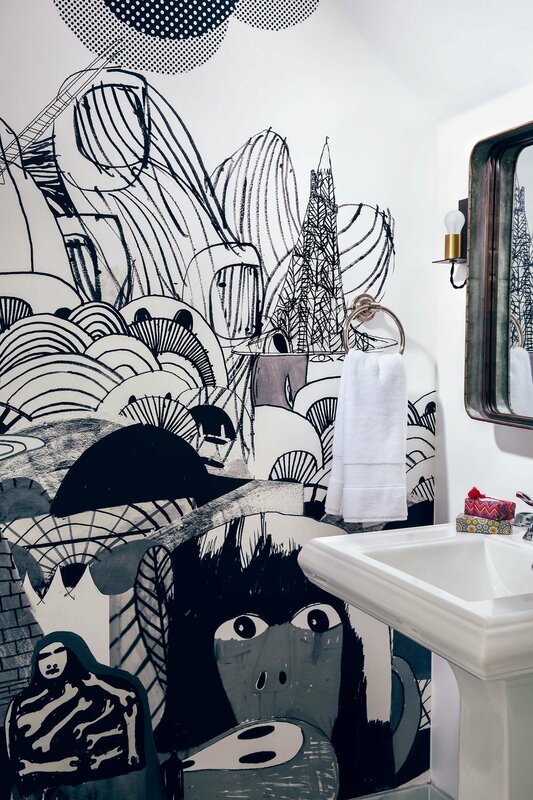 A floor-to-ceiling graphic mural from Paris transformed this unassuming powder room. Every house needs that place where eating and relaxing come together. Hardworking velvet microfiber upholstery and a dark marble coffee table means spills are no problem. Subtle wallpaper patterns are brought to life with the texture in these hand-embroidered lumbar pillows from John Robshaw. The gorgeous base on this Nickey Kehoe table comes alive on this vintage Moroccan rug. 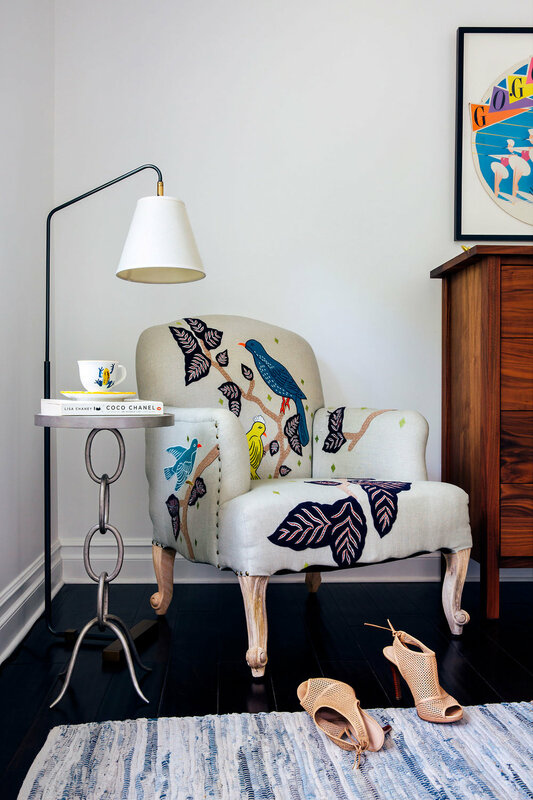 A rattan egg chair is the perfect spot for the littlest family members. Moody wallpaper and an indulgent daybed make this room binge-watch ready. The curves in this arm chair blur the line between work and a great nap. The dry erase paint on the office’s back wall does the same—brainstorm or doodle? 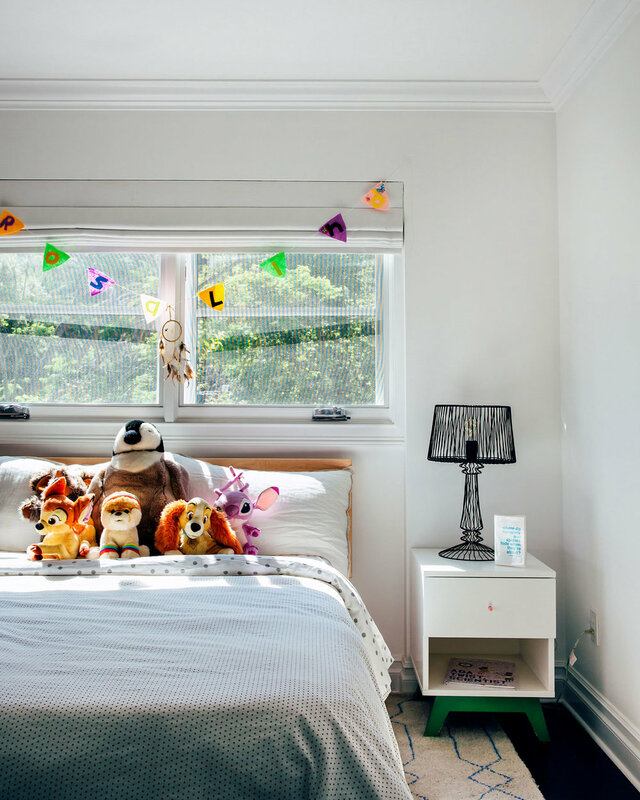 This little girl needed a room that was as vibrant, dynamic, and creative as she is. What to do with an extra-wide hallway? Create a cozy spot for a book. A sun-drenched guest room that’s equal parts soft and bright is the best welcome mat. Plush carpeting under foot, soft linen bedding, and a mix of pillows from Mali and Japan form a soothing, eclectic retreat at the end of the day. Creating whimsical moments, like this carved wooden dresser, injected the homeowners’ personality into each room. Oversized mirrors framed in antique glass build drama without disrupting the spa-like feel of the master bath. An expanse of cool marble pairs perfectly with rich greens, unusual accessories, and warm light. 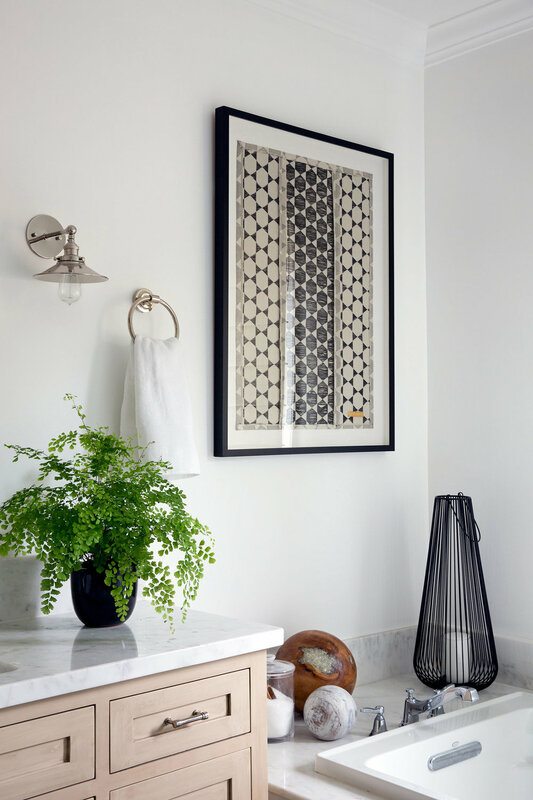 Framed Senegalese textiles bring the unique moments throughout the home into the bath while complimenting the classic finishes.